High-grade engineering services, innovative software solutions and value-adding consultancy services for industry – you get all this from a single source with SALT AND PEPPER. Our three business sectors are run independently but are also interconnected. You can make use of the expertise in just one sector or rely on the combined know-how of several experts. You will anyhow be profiting from our comprehensive range of services – quite simply because we always have the interdisciplinary know-how from across the whole SALT AND PEPPER Group in the back of our minds and approach challenges from a variety of viewpoints. High-grade engineering services on- and off-site: to achieve your goals we provide flexible know-how or act as comprehensive development partner. Together with you we understand the task and offer you the appropriate form of contract according to the scope of the project. Individual software solutions and innovative software products: on the basis of agile methods we develop solutions for the digitalisation and networking of industrial processes – efficient and expedient. Operative excellence and innovative skills: using our approach to consultancy, we make your company the best possible version of itself. Together with you we put what exists to the test and implement systematic innovations. Sharing knowledge: we act internationally for our clients. We have two of our own offices in China where offer our three integrated service sectors and enable progress through German engineering skills. Our fiscal year goes from April, 1 to March, 31. The fiscal year 2018 terminated on March, 31. The basis of all our activities are our four values: Passion, Creativity, Professionalism and Respect. We live these values, both internally and externally, and treat everyone as we would wish to be treated ourselves – as an equal partner. We are intrigued by technology. Seeking the perfect solution is our motivation. Absolute customer satisfaction is our goal. We don’t just add up one and one but always think one step ahead, with a dose of healthy ambition. In short, we enjoy our work and love to excel ourselves. We are always eagerly looking ahead; we have great ideas for innovations and posses the necessary creativity to implement them. We think outside the box and at the same time have a good understanding of what is feasible. Being flexible and moving forward is important to us. We are open to the seemingly impossible and proud when our solutions lead to success. The foundations of our work are clear structures and processes, which we are constantly adapting. This is what we rely on and that’s why our clients can rely on us. We have already gone from strength to strength and we are continuing to improve through expanding experience and ongoing internal training programs. And we are also have the courage to say “No” if necessary, to admit to mistakes and learn from these, developing new solutions. Honest and fair cooperation is the beginning and the end for us. Our work is characterised by respect on all levels, even beyond company boundaries. People are only open to exchanging views when they feel appreciated, allowing a common vision to develop. It all began during an evening of cooking together on a remote North Sea island. Four impassioned amateur chefs mulled over the past and discovered something new. While seasoning their menu, they had the idea for SALT AND PEPPER - and the name was right there. The four amateur chefs – Sven Scholz, Gisbert Dörner, Marko Schluroff and Florian Kirstein – had been professionally connected before and were highly enthusiastic about the concept of pooling their ideas, their know-how, their years of professional experience and their experience in various sectors in a joint Company. That was back in 2008. 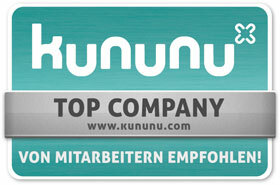 Today SALT AND PEPPER is a successful group of companies with more than 650 employees in Germany and China. One business department – technology consulting – has become three. This construction makes us unique in the market. This development is underpinned by our culture which creates freedom and entrepreneurship. This is the basis for our success. "It’s not the large that defeats the small, but the quick the slow. Flexibility and responsiveness mean that we and our customers rapidly achieve our goal." "In order to remain competitive in the market, every company needs a professional IT infrastructure which is optimally focussed on the value-creating business processes." "Excellently run companies create the ideal conditions for employees to develop their full motivation and to be able to contribute all their professional expertise to their tasks." Specialities: Development of Organisation, Sales, Recruiting and Management Training. Branches: Cologne, Ratingen, Stuttgart and Munich. Earlier positions: Sales engineer and project manager in the production technology industry, team leader, branch and business unit manager with a leading engineering service provider. Joined SALT AND PEPPER as a manager in 2008. Former positions: 10 years in leadings positions for well known OEM, Managing Director for IT company, joining SALT AND PEPPER as Managing Director in 2019. Specialities: Operational management of the Company, strategic further development of the organisation. Earlier positions: Team leader for a leading engineering services provider, joined SALT AND PEPPER in 2008 and progressed from branch manager to executive. “We always follow the motto: first understand, then be understood. Only when we have understood the future needs of our client and of the market are we then able to offer the right solution or open up new areas of business. Earlier position: Sales engineer, branch manager, CEO of a branch and regional director at two leading engineering services providers. Respect is one of our four key values. We are committed to this not just in terms of our clients and staff, but also towards society as a whole. We assume responsibility, in that we develop trainees and support those in difficult situations with action or with financial means. Here they are: our credentials. If you find customers missing from this list, it’s not because we are not working with them but because we are not allowed to name them. Some things just have to stay secret. As you know, technical progress is a commitment.